A critical examination of the 'saint' of non-violence, Mahatma Gandhi, and his role in the 'liberation' of India. His theories of civil disobedience were rooted in Hindu theology. He preached the unity of classes among Indians, the rich to be "trustees" to the poor. This message of class unity was vital if he was to create an alliance between the industrialists and the rich peasants. Indian capitalists enthusiastically welcomed these ideas, and he was financed by some of the leading industrialists in West India, the Sarabhais, textile magnates in the Gujarat, and the Birlas, second largest industrialist group in all of India. Millions of rupees were given to him over a period of 25 years. The rich peasants and shopkeepers also provided a pool of activists for his Congress Party. Gandhi, due to his simplicity of life style, was able to mobilise peasants and workers behind him in the cause of nationalism, where the Indian politicians in top hats and morning suits would have found it very difficult. He facilitated a cross-class alliance for nationalism. 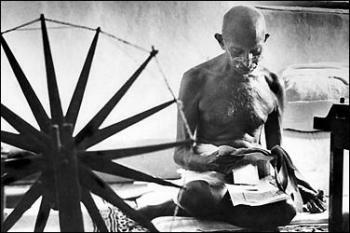 Gandhi had advocated his doctrines of non-violence from early on. This did not stop him from supporting the British in 1899 in the Boer War, volunteering to help them and organising an ambulance corps. As he said, "As long as the subjects owe allegiance to a state, it is their clear duty generally to accommodate themselves, and to accord their support, to the acts of the state". When Gandhi was organising a mass march in South Africa in 1913, to obtain rights for Indians there, the white railway workers went on strike over pay and conditions. Gandhi immediately cancelled his march, saying that civil resisters should not take advantage of a government’s difficulty. On the outbreak of the First World War, Gandhi actively recruited for the British war effort, despite his ‘pacifism’. On the outbreak of the Second World War, he publicly pledged not to embarrass the British, and would lend moral support to the Allies. There are crucial falsities in this article. 1. The claim "by 1919 the Indian capitalist class had decided they wanted independence from the British rulers." is utterly baseless, firstly, because there was no united capitalist class in India. Industrialists and Traders, merchants had different economic interest and within these spectrum had different concept of "freedom". The Industrialists started opposing the British government only after mid 1920's and in 1930, when after sever loss in tax bargaining and post-depression shock they realized they cannot make profit within imperialism. There were two camps of Big Business in India in this period. That of Tata and other of Birla. Tata was ultra right and created a shortly lived United Capitalist Party, while Birla found "salvation of Indian capitalists" in Congress as the right does not generate confidence in public. 2. "The Indian capitalist class came to the conclusion that after the failure of the propaganda campaign, mass action was necessary to gain independence." Both of these Industrialist camps, sometimes in opposition to traders opposed even the peaceful mass activities of Gandhiyans. In Non-cooperation movement and in Quit India they were against the mass mobilization part of the struggle. 3. The "unity of classes" argument is also not sound. Though Gandhi rejected class struggle squarely (while replying to the newly formed Left wing of Congress), capitalists did not like Gandhi's anti-industrialist anti-modernism thinking. That's why in 1940's they started favouring Nehru over Gandhi. Nehru's Stalinist rapid industrialization reassured them, given the control of State be restricted and only used when the capitalists need it for making risky investment, friendly tax regime and the like. 4. "Gandhi never questioned the concept of "legality" either." He did from time to time. He was not a principled man. While breaking the Salt law, he say it as legitimate breaking of law. He was a non-principled, anti-working class, misogynist, racist, castist and pro-capitalist. He has nothing to contribute to anarchism.